Atlanta Polymers provides both post-industrial and post-consumer plastic scrap recycling. Our customers benefit from our extensive network of affiliations and leading-edge material flow and processing systems. These tools allow us to buy all marketable forms of plastics, clean or contaminated, with prompt service and payment at current market prices. Our Commercial Recycling allows large manufacturers to profit from plastics that would otherwise be deposited in a landfill. Atlanta Polymers makes plastic recycling an easy, reliable and profitable process. 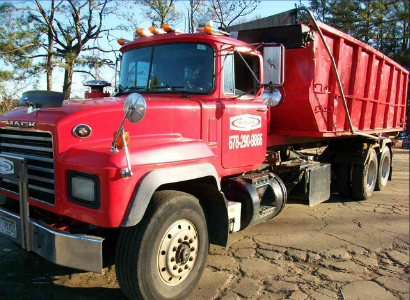 We offer waste audits, on-site balers and containers, pick-up service at no cost (based on volume and distance), granulation, shredding, and certified destruction. We also handle cardboard and metal recycling. We have 70 yd, 40 yd and 30 yd boxes available. Let Atlanta Polymers work with you to identify and organize the most efficient way to recycle plastics. With every pick-up, we will give you an accurate quote and pay you up front. Your plastics will then be shredded and granulated, which ensures protection of your proprietary information and allows the plastic to be directly reinstated into a manufacturing process. Atlanta Polymers also accepts plastic recycling from the community. Plastic, which is made from petroleum, will not break down in a landfill. It is up to responsible members of the community to recycle plastics! Consumers in Metro Atlanta are welcome to bring in all household plastic recycling, electronics recycling, and even plastic bumper recycling. Contact us today to learn more about our recycling services!